August 2017 - Approval Authority updated. March 2018 - Amendments including update of policy name in accordance with policy approval request. April 2018 - Updated Procurement Framework Diagram. June 2018 - Administrative amendment to section 6.2; formatting corrected. Procurement is the overall approach and process of buying goods and services from the market. It includes assessing and understanding what needs to be bought and where it can be bought; developing and adopting a strategy to engage with the market to meet identified demand; contracting with suppliers; transacting; and managing supplier performance and relationships. A strategically focussed and well-managed procurement function can significantly improve an organisation's financial performance and overall value. UQ has a significant annual procurement spend which supports, services and maintains its operations and a sizeable asset base. Mandatory compliance requirements, governance protocols and good business practices oblige UQ to use its procurement resources and power effectively, efficiently, fairly and with a high degree of responsibility and accountability. 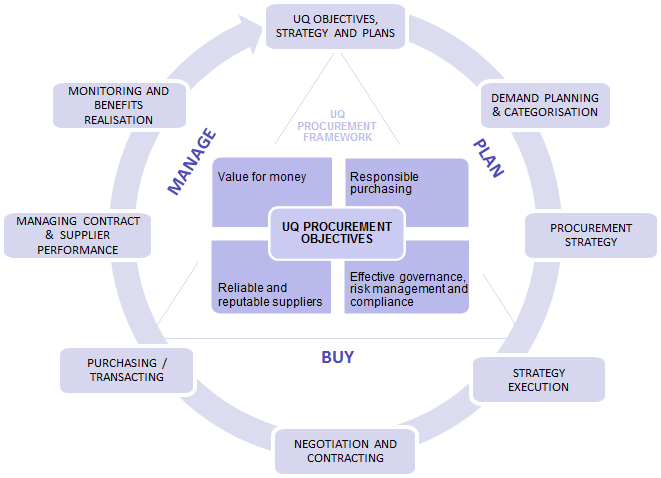 The UQ Procurement Policy provides the overall framework, direction and oversight for the sustainable, systematic and disciplined performance, governance and management of the procurement of goods and services across UQ including category management, demand planning, sourcing, buying and post-contract supply management. Recognises Enterprise Procurement (Governance and Risk Division) as a leader, enabler and optimiser of the procurement function across UQ. All staff, students, contractors and others who purchase for or on behalf of the University are required to comply with this policy. For staff and contractors, compliance with this policy is a condition of their appointment and continuing employment/engagement with the University. For students, compliance with this policy is a condition of their admission and ongoing enrolment at the University. Where full compliance with this policy may not be feasible or not in UQ’s best interests, written request for Procurement Process Exemption from the relevant delegate, and in a form prescribed by Enterprise Procurement, may be made to Enterprise Procurement. Any request for exemption must adequately demonstrate the business need for the exemption and may be based on appropriate reasons including but not limited to genuine urgency, criticality, recency and security/confidentiality. See Appendix A for definitions. As a statutory body in Queensland, UQ is obliged to comply with the Queensland Government’s Queensland Procurement Policy 2017, which is underpinned by the following six objectives: (1) value for money; (2) advancement of economic, environmental and social objectives; (3) integrity, probity and accountability; (4) leaders in procurement practice; (5) working together to achieve outcomes; and (6) governance and planning. UQ’s procurement objectives and policy are aligned with the Queensland Government procurement objectives and explained in the following section. Advance UQ’s strategic and operational objectives including sensible pursuance of viable opportunities, and ensure that resources are acquired economically, used efficiently and managed effectively. Deliver value for money including best cost commercial outcomes from purchasing decisions and activities with agility in a highly specialised and fast moving competitive field. Value for money is defined as the most advantageous combination of cost, quality and sustainability to meet UQ’s requirements. Engage in economically, socially, environmentally and ethically responsible and sustainable purchasing. Purchase only from reliable and reputable suppliers with competitively priced contracts and supply chains that are consistent with UQ’s responsible and sustainable purchasing principles. Meet all applicable compliance obligations relating to purchasing including compliance with laws, regulations and contracts. Demonstrate effective governance and risk management including integrity, probity, fairness, transparency and accountability in all purchasing decisions and activities. Holistic and robust demand planning including aggregating UQ-wide procurement demand to optimise procurement efficiency opportunities. Efficient, flexible and adaptable category-based procurement plans, sourcing strategies and processes. Effective and efficient category and supplier performance management and monitoring. Adopting procurement practices and appropriate systems that enable efficient, creative and innovative solutions to meet business needs and challenges. This section outlines the principles and key requirements that apply to the procurement of goods and services across the University. These principles and key requirements are in addition to the application of UQ’s Values, Code of Conduct, general management controls and other UQ policies that impact procurement. Non-compliance with these principles and key requirements may lead to termination of employment, engagement or continued enrolment at the University. a. Enabling and ensuring UQ’s interests take precedence over the interests of other parties in all procurement decisions and activities. b. Undertaking holistic and robust planning to understand its demand profile for goods and services and using that information to inform its procurement activities including budgeting and financial management. Such planning will be based on consultation, collaboration and constructive and respectful engagement with relevant stakeholders to better inform procurement decisions and activities. c. Aggregating and grouping its total procurement under meaningful procurement categories to enable better planning and procurement including better leverage and efficient sourcing from demand and spend consolidation. See Appendix B for a list of Procurement Categories and Category Owners. d. Where feasible, beneficial and legally permissible, collaborating, cooperating and forming alliances with other compatible organisations to further leverage our buying power to deliver better outcomes for UQ and its primary stakeholders including staff and students. e. Adopting a category-based, centre-led procurement operating model with leadership and governance provided by Enterprise Procurement in collaboration with Category Owners. f. Ensuring all procurement sourcing initiatives are planned and performed in a disciplined, cost effective and timely manner. g. Planning and tracking benefits arising from the procurement function and in particular major procurement sourcing initiatives, decisions and contracts, and monitoring to ensure benefits are realised. a. Advancing UQ’s objectives and priorities. b. Fit for purpose as well as compliance with UQ’s specifications. c. Quality of goods and services. d. Quality, credit worthiness and reliability of suppliers including service and support. e. Opportunities for further value add including efficiency, innovation and automation. f. Whole-of-life costs including transaction costs associated with acquiring, using, holding, maintaining and disposing of goods and services (also known as Total Cost of Ownership). a. Not engaging suppliers who have supply chains that utilise slavery, bonded labour, child labour, unfair working conditions and wages, or exploitation including suppliers from countries covered by the Autonomous Sanctions Act 2011.
b. Taking all necessary steps to proactively identify, build relationships with and purchase goods and services from certified small businesses as well as enterprises owned and operated by community groups, such as people from culturally and linguistically diverse backgrounds, Aboriginal and Torres Strait Islander persons and people with disabilities. To further enhance equity and inclusion, UQ will proactively promote gender balance through procuring from female-owned businesses. c. Giving priority to the acquisition and use of goods and services that have a lower environmental impact over their life cycle. a. Prior to contracting, testing the market in a consistent manner without any bias, or perception of bias, so that potential suppliers have confidence in the outcome. b. Undertaking appropriate due diligence of suppliers to assess their ability, capacity, reputation and authority required by law to provide the goods or services reliably and professionally including their prices, contract terms and conditions before engaging them. All approved suppliers will be registered in the Vendor Master File (VMF) controlled and managed by Enterprise Procurement. c. Where feasible and justified from a value for money perspective, purchasing from local suppliers. d. Proactively managing supplier performance against contractual terms and conditions and agreed key performance indicators. Any significant unfavorable variances in supplier performance will be escalated for prompt resolution. e. Collaborating with key suppliers for efficiency, innovation and improvements to our procurement strategies, processes and systems. f. Treating all its suppliers fairly and respectfully in an open, consistent and transparent manner and ensuring protocols are in place to protect the confidentiality of their commercially sensitive information. a. Goods and services are purchased for authorised UQ purposes only. b. Only duly authorised staff, with appropriate financial, contractual and other applicable delegations, engage in and execute procurement transactions including negotiating and executing procurement contracts and their management. c. Procurement plans and activities are not unnecessarily altered to circumvent this policy or the Delegations Policy. Purchase orders or contracts will not be split to bypass financial delegation limits. d. Only purchasing methods, contracting instruments, procurement systems and processes authorised or endorsed by Enterprise Procurement are used to buy goods and services. See Appendix C for a ‘How to Buy Matrix’. Any changes to procurement systems or procurement modules of larger systems, will only be made with the prior approval of Enterprise Procurement. e. Full compliance with any Special Conditions applicable to a category. See Appendix B for such conditions. f. All procurement decisions are transparent (subject to confidentiality requirements), verifiable, based on relevant and reliable information, reflect good judgment and are aligned with business strategies, objectives and priorities. g. All procurement-related commitments are made only after confirmation of the availability of budgets for the expenditure. In ordinary circumstances, the raising of the purchase order will precede the delivery and receipt of goods and services. i. The allocation of risks between UQ and its suppliers are optimised through contracts and other valid means. ii. All procurement controls and the level of effort required to give effect to those controls correspond with the nature and level of risks to be managed and expected benefits from having those controls. iii. Risks are formally assessed and demonstrably managed for all procurement greater than $1M (at individual initiative, transaction or total contract level). i. The highest standards of integrity and ethical behaviour in accordance with UQ’s Code of Conduct are observed in all procurement activities. ii. Actual, perceived and/or potential conflicts of interests are made transparent, recorded and effectively managed. iii. All contract documents including any variations and extensions to these are retained and appropriately managed. The following responsibilities and accountabilities assigned under this policy are in addition to any other responsibilities and accountabilities the relevant parties may have. Any assignment of roles and responsibilities to an organisational unit is an assignment of roles and responsibilities to the head of that organisational unit. Providing overall leadership and governance of the procurement function across UQ including enabling and ensuring compliance with this policy. Ensuring, with advice and input from UQ Legal Services, that UQ’s commercial terms and conditions including procurement contract templates comply with the law, are valid and enforceable, include appropriate legal protections, sensible, efficient and commensurate with our best in class aspirations. Reviewing all procurement sourcing initiatives (including the underlying processes to select, negotiate, enter into, vary, or renew contracts and agreements with suppliers) where the expected annual or contract expenditure is greater than $5M, and providing assurance, before any contracts are executed with the preferred supplier, on the level of compliance with this policy. Reviewing, as and when considered necessary, all procurement sourcing initiatives (including the underlying processes to select, negotiate, enter into, vary, or renew contracts and agreements with suppliers) where the expected annual or contract expenditure is between $1M and $5M, and providing assurance, before any contracts are executed with the preferred supplier, on the level of compliance with this policy. Monitoring, in consultation with Category Owners, the performance of suppliers with whom UQ’s total actual or estimated annual spend is greater than $5M. Fulfilling the role of a Category Owner for any categories assigned to Enterprise Procurement. Providing support, training and advice to Category Owners on the development and implementation of Category Management Plans (CMP) and related procurement strategies. Maintaining UQ’s Procurement Contracts Register and recording appropriate details of all executed procurement contracts and agreements (including any variations or extensions to these) that have an annual or total expenditure greater than $100,000. Maintaining copies of all executed procurement contracts and agreements that have an annual or total expenditure greater than $100,000, and copies of any variations or extensions to these. Owning and actively managing the Vendor Master File including ensuring there are effective controls to prevent any unauthorised or inappropriate changes to it. Owning and managing the UQeMarket including ensuring the relevance and reliability of its content and functioning. Maintaining a Procurement Conflict of Interest Register with appropriate details and ensuring the register is current, complete and reliable at all times. Also, maintaining copies of all completed Conflict of Interest Declaration Forms. Providing procurement processes, systems, support and training to enable an effective and efficient procurement function across UQ. Working collaboratively with Category Owners to ensure a coordinated one-UQ procurement framework is maintained. a. Demand and spend profile including forecasts. b. Supply profile including market, industry and supplier analysis. c. UQ stakeholder profile based on client consultation. d. Risks and opportunities, and plans to effectively manage the risks and pursue the opportunities. g. Negotiation and contracting strategy including the appropriate contracting period. h. Monitoring and performance management strategy. i. Expected benefits and benefits realisation plan and reporting of actual benefits achieved. j. CMP implementation strategy and program of works. Assessing and effectively managing risks to UQ relating to or arising from their categories. Ensuring any actual, potential or perceived conflicts of interests are disclosed and appropriately managed. Also, ensuring copies of all completed procurement-related Conflict of Interest Declaration Forms are promptly provided to Enterprise Procurement. Managing the process to select, negotiate, enter into, vary, or renew contracts and agreements with suppliers for their categories and managing associated supplier relationships. Ensuring Enterprise Procurement is given a reasonable opportunity to review the underlying process, key activities and any recommendations before a final decision on preferred supplier/s is made for all procurement initiatives with total estimated spend over $1M. The final decision will properly consider the outcomes of the Enterprise Procurement review (if such review is undertaken). Setting up pre-approved supplier panels where it is sensible and demonstrably efficient to do so. Enterprise Procurement will be consulted where the annual spend on the panel is expected to be greater than $5M. Providing insights, assistance and advice to internal stakeholders regarding their categories. Maintaining all category related records including copies of sourcing and related documents such as client requests and all formal communications with suppliers. Contracts and supporting documents include contract variations and extensions, copies of documents required under the contract and notes of meetings with suppliers. Copies of contract documents for contracts greater than $100,000 (annual or contract amount) are to be provided to Enterprise Procurement. Compliance with this policy and any associated procedures. Availability of budget before any procurement commitments are made. Disclosure in writing of any actual, potential or perceived conflicts of interest in relation to the procurement activity and their effective management. All procurement related risks have been identified and mitigating controls are implemented and effective. Effective management of contract performance by vendor. Necessary information, records and support is provided to Enterprise Procurement and Category Owners to enable them to discharge their responsibilities under this policy. This includes providing copies of all executed purchasing contracts and agreements for annual or total values greater than $100,000 together with metadata in the required format to Enterprise Procurement for recording in the Procurement Contracts Register. Monitoring, review and management assurance activities are undertaken at several different levels across UQ to provide confidence that all procurement activities and transactions are undertaken and managed in accordance with this policy and other applicable governance requirements. Managers and supervisors including budget holders and Category Owners will ensure all procurement activities in their areas of responsibility meet the principles and key requirements of this policy. Significant policy breaches must be promptly reported to Enterprise Procurement. Enterprise Procurement will review and provide annual assurance on the adequacy, efficiency and effectiveness of this policy. Originals of all executed procurement contracts and any variations to them. An arrangement established with successful offeror/s (including without limitation a standing offer arrangement, a register of pre-qualified suppliers, panel arrangement or preferred supplier arrangement). The strategic aggregation of purchasing requirements into a broad class to achieve additional savings, process efficiencies and other benefits. The tool or process to purchase a particular class of goods or services e.g. UQeMarket. Is the end to end all inclusive cost of the planning, buying managing (including disposal) of a specific item or service. A document which describes the business objectives and reasons for procurement, strategies, issues, approximate budget, risks and other relevant facts including specifications considered prior to issuing a formal offer to the market to supply the required goods or services. Where circumstances dictate that the purchase could not have been reasonably foreseen or planned and there is insufficient time to complete the required procurement process. Where securing the goods or services from a nominated proven supplier is critical to ensure uninterrupted provision of UQ and/or a partner organisation’s services. Under this scenario, the engagement of an alternative supplier would present significant risk and additional cost to delivering business outcomes. Where a Contract or Purchase Order for the same or very similar goods or services has been previously executed with the same supplier as the result of a full procurement process within the previous twelve (12) months. Where the procurement involves a high level of sensitivity and there are risks associated with divulging the requirement to multiple suppliers. Procurements falling within this category will require potential Offerors to complete a Confidentiality Agreement prior to the release of any Request for Quote or Invitation to Offer. Prior approval of the CFO is required to establish bank accounts, finance leases and to execute financing (loan/debt) transactions. All procurement within this category will comply with the ICT Procurement Framework developed in accordance with the UQ Procurement Policy, endorsed by the Director Governance and Risk (or delegate) and approved by the CIO. Prior approval of the Manager Insurance Services is required to purchase insurance policies. Prior approval of the General Counsel is required to procure and instruct contractors and consultants for legal advice and other legal work. The Faculty of Law is exempt from this part of the policy when engaging Legal Specialists specifically for Lecturing or for Legal Research purposes. All external marketing campaigns and engagements of marketing and communications consultants, as well as engagement of all advertising and media agencies require the prior approval of the Executive Director, Strategic Marketing and Communications. Property and Facilities Includes capital works, building repairs and maintenance, cleaning, postal services, stores and internal site distribution. Prior approval of the Director Property and Facilities is required to procure and instruct consultants/contractors in the following areas: Engineering, Architectural, Quantity Surveying, Building and Construction contractors, Licensed Electrical and Plumbing contractors as well as all facilities related services such as Cleaning, Carpentry and Tiling. Prior approval of the respective directors are required for any deviations from the standard agreements relating to student services. Prior approval of the Manager University Travel is required for any deviations from the University’s standard agreements relating to travel. § For a single transaction, use the value of that transaction. § For Contract, use the total value of the contract (including any binding renewals/extensions). Note, the higher the purchase amount, the stronger the need to document the justification for the decision. § (i.e. registered in our system/s or for credit card transactions, unblocked merchants). § Select from the approved panel of suppliers within the appropriate Category. § Select from the approved panel of suppliers. § Select from the approved panel of suppliers via a competitive process where there is more than one supplier. Procurement contract templates are maintained by Enterprise Procurement. All contracts are to be executed in accordance with relevant delegations policy and instrument/s. October 2018 - URL for piloted forms added.